1. Site Investigation – most drilling activities happen before construction starts. This is basically to determine if the place for building your property has a stable soil – not too soft or not too dry to so that your house might get sucked in like that of a quicksand or cause cracks on your flooring and walls. This is a very important step in building either a home where your family lives , and specially a building where a lot of people goes in for either work or other activities. 2. 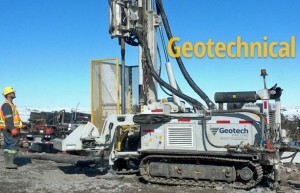 Geotechnical Drilling – A specific type of drilling that is related mainly to construction and methods of geoengineering, Geotechnical drilling is mainly monitored and supervised by a Geotechnical Engineer who stays on the site to make sure that the job gets done properly. A lot of firms offer this service where they bring in special drilling equipment to the site to achieve maximum results. Among the known Geotechnical Drilling Companies in Sydney and other parts of Australia will be Terratest Group, Rockwell Drilling Services, Matrix Drilling, Numac and Hagstrom Drilling. 3. Environmental Drilling – While Geotechnical drilling focuses mainly on the methods performed in geoengineering, Environmental drilling on the other hand focuses on assessing natural hazards, waste contamination solutions, containment, remediation, etcetera. This is also done when you want to drill for oil on sea. 4. Dangers involved in Drilling – They say drilling s one of the most dangerous jobs in the world. Oil Drilling for one involves exploring the deep seas – this means searching for an oil source in an unstable area. From men diving in search for a great spot for drilling, to closely monitoring and fixing heavy equipment for jams or technical problems, to possible oil leaks and explosions, this job is dangerous to both the worker and the environment. 5. Importance of drilling – Although Drilling (specially oil drilling) may be considered an unnecessary activity, the benefits have been service us for decades. Without drilling, there will be no secured foundations for our homes, buildings we work to, and specially gas to fuel our cars and basically to run our communities and governments. It’s best to always look on the bright and beneficial part of things before we consider it as destructive or dangerous. Men who work on the field for drilling are mostly physically exhausted and risk their lives to give us the benefits that we are enjoying now. Taking responsibility is one key to make sure that we reap what Mother Nature offers without fully destroying it.